World renowned for its game, Chobe is known as a symbol for many things that are unusual, exciting and interesting in Botswana. 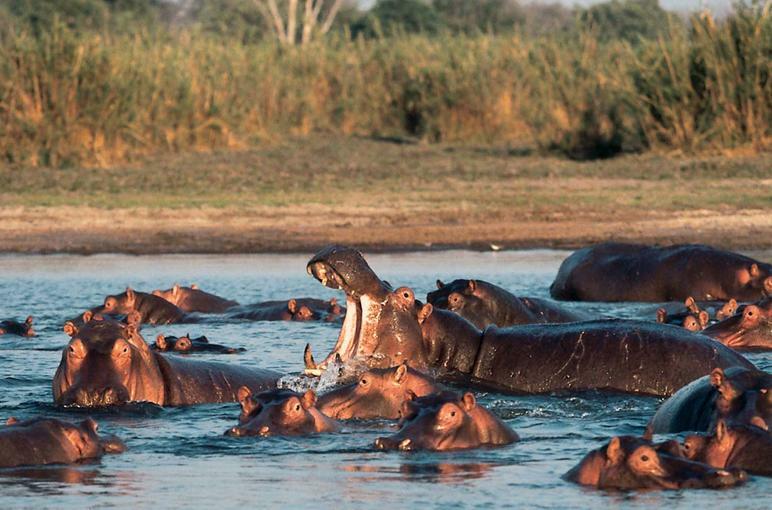 Chobe is the second largest park in Botswana and can be divided into 4 main focal points. Chobe River front with floodplains and teak forest, Savute Marsh in the west, the Linyanti swamps in the north-west and the hot, dry hinterland in-between. Chobe National Park is 11,700km in size. Chobe Natioanal Park is the second largest park in Botswana and the third largest park in the world. The park covers a wide variety of the country's riverine forest; flood - plain, periodic marsh, mopane and miombo woodland and a few rocky outcrops. Such a diversity of habitats ensures a wide variety of wildlife.Wildlife ranges from water animals like Hippo, Crocodile and Otter, to forest and dry-land species such as Elephant, Buffalo, Giraffe, Zebra and Eland. In all areas predators are abound - including Lion, Leopard, Cheetah and Hyena. The road system is a recent development and is best explored in a four-wheel drive vehicle. The Chobe river is known for its magnificent bird viewing. There are over 400 different species in Chobe National Park, ranging from Eagles to Kingfishers and from Marabou storks to Bee-eaters. Occasionally, carmine Bee-eaters build colonies in the sand banks of the flood-plains where they nest in their thousands. Chobe National Park is dry from May to October and becomes more and more parched as the season progresses. Inland waterholes dry up so animals, particularly Elephants, congregate by the river in huge numbers. As the foliage reduces, animals are easily visible and this is the best time to come. Riverboat trips in the dry season are particularly rewarding. Rains are expected any time from October onwards and the air begins to feel heavy with impending rain clouds and hot temperatures. It rains anytime from November / December to March but tends to peak in January and February. Although the rain turns the clay-soil into a driver's nightmare, much of the area is still accessible and river safaris avoid the muddy roads in the park. This is summer rain so the temperature and humidity is high and biting insects are in the air. So are the birds and it is a fantastic time to see the whole colourful spectrum of African birdlife. Pastures burst into life again ready to feed the many small mouths of antelopes and zebra, who give birth in this time of abundance.During the dry season between March and October, is the best time to see the the large herds of Elephant and Buffalo. The dry winter months are from May to September and can be cool, especially at night. Game viewing is excellent throughout the year. NB: You are strongly advised to take medical precautions for malaria.